Dr. David Jernigan, Biologix Center: Your symptoms may be caused by contact with this common plant decades ago! Your symptoms may be caused by contact with this common plant decades ago! If you have ever had a bad bout of Poison Ivy, Poison Oak, or Poison Sumac you might have one or more of the following chronic systemic symptoms for years, even decades, after that you would never associate with the Poison Ivy. Topical ivy relief creams and cortisone shots may stop the skin problems, but poison ivy is not just a skin problem. The poison found in these plants is an oil called Urushiol. Urushiol is a molecule that is called a hapten. Haptens are molecules that bind with proteins in your body and then once they are bound up, they can cause an immune reaction with T-cell proliferation. is also a systemic poison and neurotoxin. When urushiol binds with proteins from your body it forms the hapten, quinone, causing a strong immune response possibly causing problems in many other parts of the body than just the skin. These poisons can attach to your body's own antibodies leading to an autoimmune response that can trigger longterm, virtually undiagnosable, systemic problems. How many people are being told that they have an autoimmune problem, of unknown cause? Obviously, not everyone that has an autoimmune disease is experiencing the problems from having had one of these reactions, but read on and see if your symptoms match...and think back to remember if you ever, even as a child had a case of Poison Ivy, oak, or sumac. The full systemic effects of Poison Ivy can be seen in the homeopathic "proving" of the juice from the plant that is homeopathically potentized and then administered to healthy people for research purposes to determine what energetic symptoms arise from repeated dosing. This type research goes back over 200 years. It is fascinating to see ,in the case of Poison Ivy (Rhus Toxicodendron), just how many systemic problems it can actually cause as a substance beyond just the well recognized skin rash, by observing what the energetic, homeopathic provings reveal. Poison Ivy can affect the spinal cord and nerves leading to extreme muscle weakness, with stiffness and pain of the muscles and joints. This stiffness and pain are unique in that they are worse until you get going and limbered up, therefore people feel better for a bit from changing positions. The symptoms are worse in cold weather. The pains are worse at night, making it so that one cannot rest in any position. Generally the pain appears on the left side and may go from left to right. Extreme restlessness, anxiety, sadness, with great apprehension at night to the point that one cannot remain in bed, are the effects on the mind that mark this unique poisoning. The mind and senses also become cloudy. Once asleep the sleep is heavy as from stupor, and the dreams are filled with situations of great exertion from which people awaken tired, stiff, and sore. 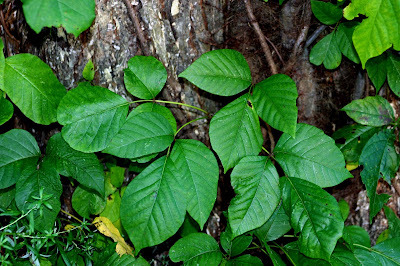 The neurotoxic effects of poison ivy also aggravate the heart, often causing trembling and palpitations when sitting still and again improves with movement and when walking. The heart feels tired and may have arrhythmia. Poison Ivy may also cause a bitter, coppery taste in the mouth with TMJ pain, with popping of the jaw. This is just a short list of possible symptoms, so as you can see Poison Ivy is much more than a skin problem. It can cause chronic symptoms, that seem to have no cause from a medical testing perspective. Since there is no lab test to determine latent problems from Poison Ivy that a person might have had decades ago, a wise doctor will recognize the pattern of symptoms outlined above, and through just a good case history, will ask you if you have every had a bad bout of Poison Ivy or Poison Oak. The correction of these chronic or acute symptoms can only to be found in the correctly tested and selected homeopathic remedies, Rhus Toxicodendron 30c (Homeopathically potentized Poison Ivy, using only the molecular vibrational energy of the plant), Apis 30c, or other potencies or remedies, as determined by your health care practitioner. Of course, if there are other issues either predating or concomitant to the poisoning that your doctor will need to address those at the same time. It would be nice if one or two remedies would just fix everything, however when the tissues are compromised they become susceptible to other challenges from your environment that make the issues even more complicated. Doctors trained in the healing philosophies of Biological Medicine view the totality of what has gone awry in a person, and trained extensively in natural ways to restore the functional integrity so that the body can return to optimum health and quality of life. I think it is interesting that many people are given a diagnosis of this, that, or the other disease, when if the doctor would do a good case history and ask if they had ever had a severe case of Poison Ivy it just might lead to a complete and rapid restoration of health after years of suffering! I had poison Ivy toxicity a decade ago when I burnt it. I looked like I had gained 300 lb. My face was so swollen, I had no neck, eyes were closed shut, lips were swollen, had such problems breathing and was so sick for 6 weeks till I found out abt Jewelweed. Besides Lyme, Bartonella and Q-Fever, I now have such a hard time walking in the morning as well as after I just sit for 1 hr..